Coagulation is the process by which blood changes from a liquid into a blood clot, to cause the cessation of blood loss from a blood vessel. The process involves the activation, adhesion and aggregation of platelets, and the deposition of fibrin. In reality, these are not distinctly separate, and all occur simultaneously as a result of multiple cascades. Endothelins – these are the primary hormones involved in the vascular phase. They stimulate smooth muscle contraction and stimulate cell division of endothelial cells, smooth muscle cells and fibroblasts, thus aiding repair of the damaged site. Endothelial cells also become ‘sticky’ and will express surface proteins that allow them to ‘stick’ to other endothelial cells, in an attempt to close of the damaged area. If the damage to a blood vessel is small enough, it can be ‘plugged’ by a platelet plug. Low platelet count – thrombocytopaenia – this is a process either of high platelet destruction, or low platelet production. High platelet count – thrombocytosis – this is usually a result of increased platelet formation, most commonly seen in response to infection, inflammation, and cases of cancer. Platelet formation is controlled by TPO (thrombopoietin – this is basically the platelet version of EPO!). TPO is produced mainly by the liver – thus in diseases of the liver, problems with clotting (mainly seen as manifestations of bruising) are commonly seen. The platelet phase begins as soon as platelets begin to attach themselves to damaged areas of endothelium – normally collagen. This process begins within 15 seconds of injury. The attachment of platelets to exposed surfaces is called platelet adhesion. As more and more platelets arrive, we get platelet aggregation, and finally, once a certain mass of platelets is reached, we have platelet plug formation. This is a totally normally process, and will occur thousands of times a day. People with problems with platelet formation may get thousands of tiny haemorrhages, and problems bruising easily. ADP, thromboxane and Ca2+ ions are all released – these can act on nearby platelets, and attract them to the site, causing them to adhere to the platelets already present. This creates a positive feedback loop, causing aggregation of more and more platelets. α – these contain growth factors, like fibrinogen and PDGF – a disease caused by a lack of α granules is called grey platelet syndrome. This is a rare genetic disorder (autosomal dominant) that causes. It will just basically cause reduced clotting. Negative feedback of the plug formation is controlled by prostacyclin released by the endothelium. This reduces platelet aggregation. White cells in the area also release proteins that prevent the clot getting out of control. Plasma enzymes will also break down ATP that is found circulating near the plug, and thus reduce the amount of energy available to the platelets. Fibrin – is the activated form of fibrinogen – which is produced by the liver, and also by platelets. It is activated in the clotting process, and forms lots of fibrin threads – which help to stabilise a platelet plug, as well as isolating it from the normal circulation, thus acting as a further feedback mechanism. Fibrin is possibly the single most important protein involved in clotting! Fibrinogen is soluble, but fibrin is insoluble, and thus once fibrin becomes activate it begins to ‘precipitate’ out of the plasma. Activated fibrin will basically entangle platelets, and passing red blood cells in a big nasty ball – a blood clot! This begins about 30 seconds after the initial injury. It involves a complex sequence of events, that ultimately lead to the activation of fibrin from fibrinogen. There are two separate clotting pathways, the intrinsic and extrinsic. These eventually join together to form the common pathway. Begins in the blood stream. It is basically activated when blood is exposed to collagen (or other damaged surfaces, but collagen is the main thing involved). XIIa, with the help of HMW kininogen,activates XI to XIa. This can proceed more quickly in the presence of prekallikrein. Simultanesouly, platelets will release PF3, and also simultaneously, VIII will be activated to VIIIa. Begins in the vessel wall. Damaged endothelial cells will release factor III (tissue factor), and the greater the amount of damage, the more is released. This combines with calcium, and activates factor VII and turns it into factor VIIa. This VIIa-tissue factor complex is quickly inactivated by antithrombin III! Xa, with the help of calcium ions, and Va will turn prothrombin into thrombin! Factor V is not activated until it has come into contact with thrombin itself. Thus V is not required for this step, but when present will increase the rate. Thrombin will then activate fibrinogen to fibrin. Fibrin strands will begin to join together, and with the help of XIIIa this will cause the cross-linking of fibrin strands. XIII is also activated by thrombin. XIII is also known as fibrin stabilising factor. 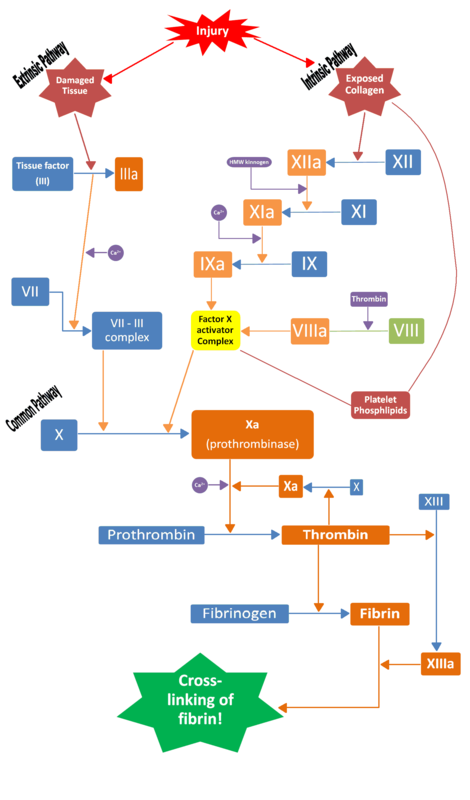 The extrinsic pathway produces thrombin very quickly, but in small amounts, the intrinsic pathway produces a large amount of thrombin, but takes a while to get going. TFPI – Tissue factor pathway inhibitor – this is a protein that directly inhibits Xa – even when present at very low concentrations. It is important in regulating the clotting cascade. Antithrombin-III – this is am enzymes found circulating in the blood that binds to thrombin, thus preventing its action. It is crucial for the action of heparin! Activated fibrin will remove and inactivate thrombin. About 85-90% of the thrombin produced is inactivated in this way. This combines with antithrombin-III, and force a conformational change in the compound, so that it acts at various stages of the clotting cascade to reduce clotting. It increases the effectiveness of antithrombin-III by over 1000x. Heparin does not act directly on the extrinsic pathway. Heparin is available as unfractioned heparin (‘normal’ heparin) or in various low molecular weight preparations. Note that heparin can be inactivated by nicotine! HL – approx 30 minutes – but this is unpredictable! It can increase to up to 2-3 hours with larger doses. The majority of heparin is metabolised by endothelial cells – hence its unpredictability. The rest is mainly metabolised by the liver, and some is excreted by the kidney. The half-life gets longer the greater the amount of drug you use because once you get past the ‘saturation point’ the endothelial cells can no longer cope with the drug, and thus slower mechanisms, such as renal excretion are the primary method of metabolism, until the level of drug drops below the saturation point again. Subcutaneous – low doses are often given in this manner. Bio-availability is only about 30% when you give it by this route though, so it is not good for large doses or emergencies (i.e. PE). It also takes up to an hour before the action of the drug is seen. Intravenous – more rapid (immediate), and much greater bioavailability. Thus in the emergency situation, it is often given as an initial IV dose, followed by subcutaneous infusion. These have approximately 2x the duration of action (HL), and are far more predictable than unfractioned heparin. They have a lower affinity for binding sites (particularly the binding sites on endothelial cells) than unfractioned heparin, hence the greater duration of action and greater predictability. Note that this will also mean that more of the heparin is metabolised by the liver than when you give unfractioned heparin. They have a greater effect on factor Xa, than on IIa, which suggests that they produce an equal anti-coagulant effect to heparin, but that they have a reduced risk of causing bleeding – therefore good news all round! In clinical practice, unfractioned heparin has to very closely monitored when it is administered, by LMWH’s give you better freedom. They are also more effective when give by subcutaneous injection than unfractioned heparin, and thus, for long-term anti-coagulant therapy, patients may be given a couple of injections subcutaneously each day, and this will provide sufficient anti-coagulation. Haemorrhage! – the risk is greatest in the elderly, and may be exacerbated by alcohol intake. This is by far the most common side effect. Protamine sulphate – This will prevent the action of unfractioned heparin – so you can give it to reverse its effects. However, it DOES NOT work for LMWH’s. Osteoporosis – can occur if the drug is used for more than a few weeks. This does not occur with LMWH’s. Thrombocytopaenia – can occur after 7-10 days of therapy. It is a result of heparin induced antiplatelet antibodies. Heparin is found naturally in the body in small amounts and is produced by mast cells and basophils. Mast cells and basophils – basically the same cells, but mast cells are found in connective tissue, and basophils are found in the blood stream. Heparin is not actually one specific substance, the name actually encompasses a family of glycosaminoglycans, commercially it is extracted from beef lung or hog intestines, and due to variability of its potency, the drug is measured in standardised units, and not mass or volume. Vitamin K antagonsists– note that the ‘K’ stands for Koagulation in German! Vitamin K is a fat soluble vitamin, that occurs naturally in plants. It is essential for the formation of clotting factors 2, 7, 9 & 10. Proteins C and S are also dependent on vitamin K.
It is the most important oral anticoagulant. Other examples with a similar mechanism of action include pheninidione. Inhibits enzymatic reduction of vitamin K to its active form – hydroquinone. Binding is competitive. The effect takes several days to develop, as it is dependent on the half life of the already active factors, 2, 7, 9 and 10. Necrosis of soft tissues – this occurs mainly to tissues in the buttock and breast and is a result of thrombosis in venules. It generally occurs shortly after administration, and is a result of inhibition of synthesis of protein C – which is another effect of warfarin, and which happens more quickly than the inhibition of activation of vit K. thus for a short time after the initial administration, patients are in a hypercoagulant state. This is rare, but serious. To combat this issue, treatment is usually started with heparin, before treatment with warfarin begins. Named after the Wisconsin Alumni Research Foundation – after cows feed was changed in the USA, to contain sweet clover, and loads of cows died from haemorrhagic stroke. Warfarin acts on the extrinsic pathway, whilst heparin acts on the intrinsic pathway. Thus, warfarin efficacy is monitored using the INR – which utilises the prothrombin time. This is because warfarin acts on the extrinsic pathway – and the PT is a measure of the extrinsic pathway. Remember that the extrinsic pathway produces a bit of fibrin quickly whilst the intrinsic pathway produces large amounts but takes a while to get going. Thus the PT, which is a measurement of how quickly a small clot forms, relies on the extrinsic pathway. Heparin is measured using the aPPT. This is the activated partial thromboplastin time. This measures the intrinsic and common pathways. Method – similar to the PT – a sample is taken, then mixed with some proteins, and the time measured until a clot forms. The clot takes longer to form than in PT, because the fluid that the blood is mixed with to stimulate clot formation has no tissue factor (III) and thus the extrinsic pathway is not activated. The word ‘partial’ is used to indicate the lack of tissue factor. The liver dependent clotting factors are 2 (thrombin), 7 9 & 10! When the clotting cascade is activated, so is the process of fibrinolysis. This is basically a mechanism that prevents clotting from getting out of control, and prevents the excessive deposition of fibrin. The main mechanism involved is the release of tissue plasminogen activator (tPA) by damaged endothelial cells. Another activator; urokinase is produced and released by the kidneys as a means of prevent small clots getting lodged in the kidney tissue. Kallikrien and neutrophil elastase are further fibrinogenic factors. These circulating activators will then convert plasminogen to plasmin, which then breaks down fibrin. This actively breaks down the clot – as oppose to anticoagulants, which just reduce the chance of further clot forming. Fibrin fragments are broken down into D-Dimers. tPA can itself be inhibited plasminogen aactivator inhibitor (PAI), and plasmin is inactivated by α2 antiplasmin. Plasminogen itself will deposit on fibrin strands, waiting to be activated, by the activated factors circulating in the blood. It not only digests fibrin, but also fibrinogen, and factors II (thrombin), V and VIII. Only plasminogen that has been absorbed by fibrin will be activated by the activators, (I guess that by joining to fibrin there is a structural change exposing the active site), and plasminogen that escapes to the general circulation is broken down by its inhibitors, particularly PAI. These are still relatively new and used with caution. It should not be used to treat DVT (the risks outweigh the benefits, although it may still rarely be used) and is mainly only used to treat MI. In some cases it may be used to treat a massive PE. See ‘clinical uses’ below. They all activate plasminogen to enhance fibrinolysis. Alteplase – this is basically synthetic tPA. Tenectplase – another synthetic tPA, it has increased affinity for fibrin, and reduced affinity for PAI (which is good! ), and also has a long duration of action. They are all administered IV or intra-arterially. Streptokinase – some is removed by streptococcal antibodies before it forms its complex. Once it has formed its complex it is broken down enzymatically. After streptococcal infection, or after the previous use of streptokinase, its efficacy cn be seriously reduced to the presence of antibodies in the circulation. These can persist for several years. Streptokinase has quite a long half-life, similar to that of tenectplase (but longer than that of alteplase and reteplase). It is usually administered as a 1hr infusion for treatment of coronary artery occlusion, although longer regimens may be used when treating PE or other arterial blockages. Alteplase and associated compounds are metabolised by the liver. Altepplase is given as a long infusion of 3-24hr due to its short duration of action patients will also be given 48hrs of heparin to prevent re-occulsion, again, a result of the short half-life of the compound. Reteplase is given as two bolus injections, and tenectplase as a single bolus. Although there is little evidence to support it; heparin is also given with these compounds (although a guess it would be given anyway in situations involving clot! Just not necessarily for reasons related to the –plases. Haemorrhage – is usually minor, but can occasionally be serious, eg. Intracerebral haemorrhage. Other haemorrhagic complications may involve GI bleeds and stroke. This occurs with about 1% of those treated. It occurs slightly more frequenctly with the –plases compared to streptokinase. The bleeding can be stopped by antifibrinolytic drugs, or y giving fresh plasma (which is full of nice clotting factors). Allergy – These are very rare, and only really occur with streptokinase as a result of its bacterial origin. In MI the sooner you give the drugs, the greater their effects. You should try to ensure they administered before 12 hours after the onset of symptoms. Trials have shown that the drugs are all pretty much equal in their efficacy, but that mechanical opening of the affected artery is more effective than using thrombolysis. i.e. – angioplasty is more effective! Tranexamic acid – inhibits plasminogen activation, and thus prevents fibrinolysis.It actually binds to plasminogen, and doesn’t actually de-activate it, as tPA is still allowed to bind to it. However, the tPA binding action odes then not cause activation of plasminogen, and thus plasminogen will not act on fibrin. It is used to treat conditions where there is serious risk of haemorrhage; commonly including dental extraction, prostatectomy and menorrhagia, as well as for life-threateneing bleeding following thrombolytic drug administration. Inhibiton of kallikrien – therefore inhibition of the clotting cascade and thus aprotonin also has anti-coagulant as well as antifibrinolytic effects. It must be given intravenously due to poor absorption by the gut. Fibrinogen is soluabe and Fibrin is INsoluable – thats why it precipitates out when activated. This article as that mixed around.